← Which is more difficult? To admit your mistakes or to admit someone else was right? Hierarchies are networks! Hyperlinks do not subvert hierarchies. For many who believe in the web as way to transform society, politics, and human life, my blog may come as a shock. There is no evidence to support the claim that hyperlinks subvert hierarchies. When you check the evidence, you will find very little if any. Usually, you will find people repeating the mantra without demonstrating it or even analyzing it. See for example this blog. The ability of the internet to link to additional information – information which might exist beyond the formal hierarchy of organizational structure or published material from such an organization – acts as a means of subverting, or bypassing, formal hierarchies. The hypothesis does not seem to have been tested. The thesis never defines hierarchy or a hierarchical organisation. It seems to ignore organisational theory. Organisations thrive on information, they are organised to use it for their daily work as well as their major decisions. Accordingly, no organisation, which wants to survive cuts off its supply of, or access to, information. The thesis hides a number of untested assumptions that need to be examined to consider whether it is valid. As it stands, it is an exhortation rather than information. The first assumption is that hierarchies and organisations are built solely on, and for, access to information. Thus, those with the most information should run, or rule, run organisations seems to be the message. Yet, it misunderstands organisations. Organisations serve a number of functions from making things to delivering them. At their core, they have to executive plans, which need them to make decisions and follow through with them. This is where organisational hierarchies become important. The hierarchy is there to help be clear about roles and responsibilities when acting on a decision and making sure it is done. In some cases, information has a role and the better organisations have a feedback loop in which hyperlinks can have a role. The second assumption within the thesis is that hierarchies are bad and hyperlinks replace them are good. However, the assumption does not understand that hierarchies are networks as well. The organisational structure serves a purpose and hierarchies are only one of a kind. They too rely upon communication and information. Thus, the power of hyperlinks helps the communication between layers within an organisation to cut the transmission costs. In many ways, this does not so much subvert a hierarchy, but allow it function better, or as intended. The IRG solution developed in a 1984 suggested a way to overcome the communication problems within a hierarchy. The book suggested that, Information Routing Groups (IRG) were to be developed to overcome centralised or silo structures. The book can be seen as a precursor to hyperlinks if only in an organisational sense. In this system, the hierarchy is not so much subverted as improved. Like the management expert Peter Drucker, who argued that most middle managers could be removed because they were only information transmission points within an organisation, the theory had some merit. However, there still needs to be middle managers to execute and deliver the work. As such, the hierarchy remains, it is just reduced to some degree, and it is not eliminated nor is it subverted. 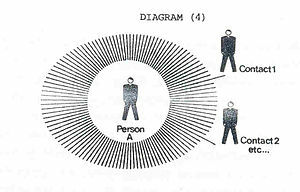 The third assumption within the thesis is that hierarchies limit the transmission of information. The thesis suggests that hyperlinks allow information to get to the “real” decision makers. In most case, the layers or hierarchy are there to serve an important winnowing process, a process by which the organisation and the constraints of a span of control, can work effectively. Consider the case of Charles V of Spain. He was the last pre-bureaucratic leader. After him, the bureaucratic structures emerged to allow leaders to handle larger amounts of territory and areas. Phillip II, his son, is likely to be the last leader to have personally overseen, through letters, an empire. The organisational structure allowed a leader to leverage their influence and power without having to be personally responsible for each decision. Overall, these assumptions betray a misunderstanding of how decisions are made and why, within an organisations. The organisational chart is a formal document that shows roles and responsibilities. One can see it as a power structure, yet it is more a roadmap. Power rarely follows structures. In the White House for example, power is based less upon the formal relationship, as given by the Constitution, than it does with the informal relationship, access to the President. We can see why National Security Advisers, like Henry Kissinger, who have more access, are successful against a Secretary of State who has formal power but is in a different location. To confuse the formal structure with the real power structure within an organisation is to misunderstand power and organisations. Finally, the idea, even when expanded, becomes incoherent. In the chapter on the 7th thesis, in the Cluetrain book, we see fuller discussion of the issue. The longer treatment of the thesis does not explain how hyperlinks subvert hierarchies. The chapter claims that hyperlinks subvert hierarchy without demonstrating it. What is worrying is that it ends with the grand statement that “conversations subvert hierarchies”. The belief is that connections change a structure. Yet, leaders use the hierarchy so that they keep the structure that serves them and not serving it. At the same time, they reach out within the organisation to find information and hear the news for themselves. A case study in this was Lyndon Johnson, the president of the United States, using the telephone to reach 3 or 4 layers into the relevant bureaucracy to check the facts. Yet, knowing who to talk to in a business about business is not the same as “shooting the breeze.” The Under-Secretary of State is very interested in your choice of Starbucks only if it is not in the way of finding out the political disposition of Karzai’s cabinet. People who make decisions need the information to make the decision and their time is at a premium to get that information. The structure is designed to get them the information as quickly as possible and efficiently. They are not there to be “democratic” or to be “friends”. They are there to get the job done. Hyperlinks help them do that, they do not subvert that process. The information will be going “up the pyramid”. The pyramid, the hierarchy, is “a network” that is good at the tasks it is set. In this way, hierarchies use hyperlinks and have the conversations but not in the way, that one perceives initially. In the end, the statement that hyperlinks subvert hierarchy remains untested and unverifiable. This entry was posted in culture, information management, innovation, knowledge worker, learning organisation, management and tagged Henry Kissinger, hierarchical organisation, Hierarchies, Hierarchy, Information Routing Group, Organizational chart, Peter Drucker, Usenet, White House. Bookmark the permalink. 5 Responses to Hierarchies are networks! Hyperlinks do not subvert hierarchies. Hello. I was searching for “traditional hierarchies” and came across your blog here. I am very impressed, having spent a good amount of time myself researching such subjects as organizations with great interest. I was hoping to make contact with you to ask a question from time to time, with your permission. Thank you.